Maximum Human Performance, commonly referred to as MHP, is a big bodybuilding supplement company. Their most popular supplements include Super Premium Whey Protein, Testronse Boosters, and XPEL, a weight loss supplement. 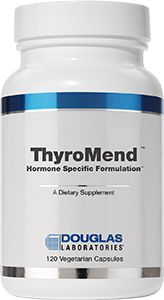 Thyro-Slim is their patented weight loss supplement that is said to help boost metabolism and support the thyroid gland. We think its really cool that a supplement is patented, but is there really a need to do so? Maybe its just for their marketing platform, as the word patented seems to be around everywhere with ThyroSlim. 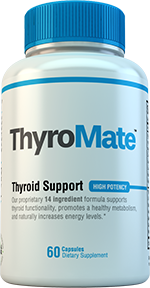 Lets see how ThyroSlim does a thyroid support supplement. 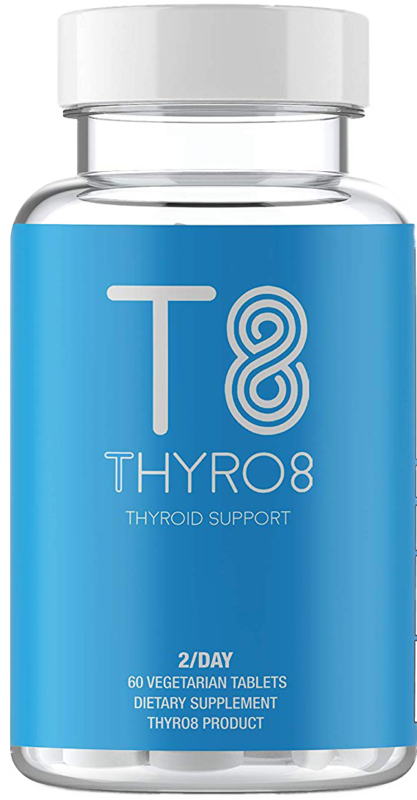 Thyro-Slim is a combination of two supplements, ThyroGenic, which you would take in the morning, and ThyroRene, which you would take before you go to sleep. Lets examine the first supplement, ThyroGenic. Within the AM capsule, there are some, what I would consider, essential herbs, minerals, vitamins such as selenium, and l-tyrosine. Immediately, however, I see a lack of Iodine. 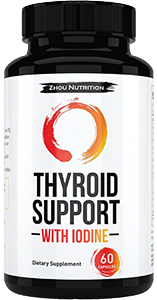 There does seem to be kelp and seaweed included in this supplement, as part of the “thyrogenic T-3 complex” section, but the lack of Iodine in the top area confuses and worries me. 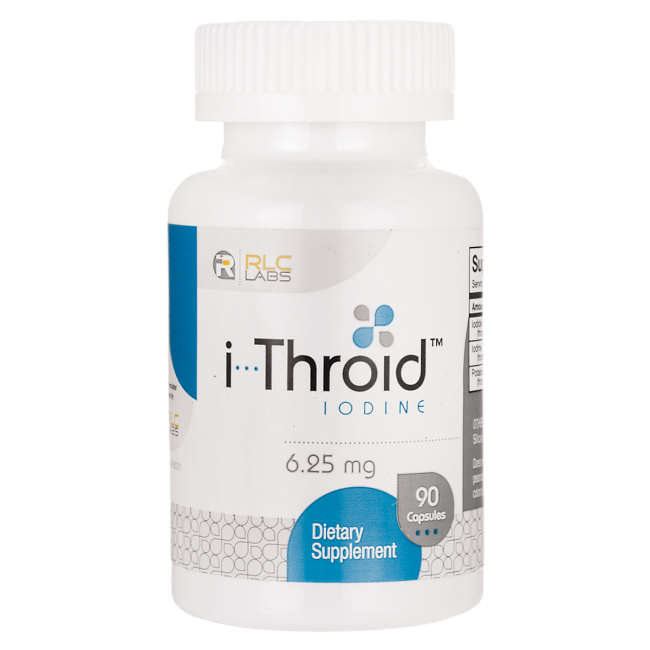 Since Iodine is the most important mineral in a thyroid supplement, it is imperative that this is included. Not sure why raspberry ketone, advantra z, and white willow bark extract is included in the AM formula. 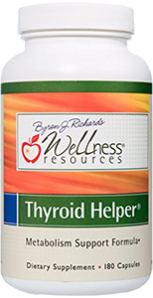 These may aid in losing weight but will do little to actually help the thyroid. 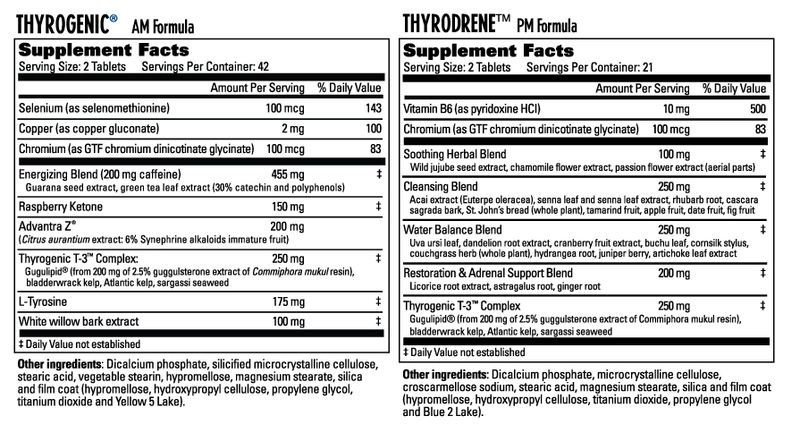 Thyro-Slim is starting to look more like one of those generic weight loss supplements than an actual thyroid support supplement. The PM capsule, also called ThyroDrene, only lasts for 21 days and contains B6, chromium, and a lot of different blends. These blends range from “cleansing” to “soothing.” There is a blend for T-3 complex and Adrenal support, so we will focus on those for right now. 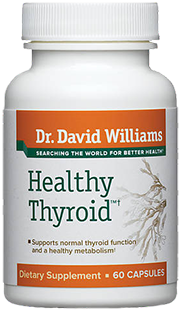 The other blends seem to be the generics for weight loss supplements so they will have little benefits for the thyroid. The T-3 complex in the PM formula is the same as the AM formula. Neither supplement still says it includes Iodine, however. Since there is kelp, I would assume it includes even a little, but it is strange that neither lists Iodine or its amount. 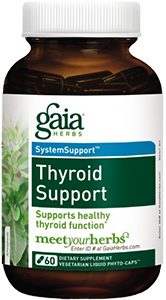 The Adrenal support blend does contain astragalus root and ginger root, which are great herbs for the thyroid. So, ThyroSlim gets some points for that, but loses a significant amount for lacking other important minerals and vitamins such as Iodine, zinc, and manganese. 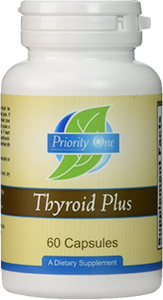 We also took off some points since there is so many capsules to take with ThyroSlim that it makes it an inconvenience, especially having to do it in the morning and then at night. With such a big company like MHP, one would expect them to be very involved in the bodybuilding community. This is certainly true. They are perhaps best displayed around bodybuilding.com through their various helpful and free articles and guides on the best ways to build muscle.We failed however, to find any articles written by MHP specifically for thyroid health and functionality. We would have liked to see this. We do like how some of the athletes they sponsor are pretty involved in certain charities. It is also important to determine how a company treats its employees. A quick look on Glassdoor, a website where employees can talk about their company, suggests that some of those who work at MHP are not happy with the company culture and the direction the company is going. Perhaps this distrust resulted from when a private investment company bought out MHP recently and brought in their own employees to replace the former workers at MHP. Whatever the reason may be, the conclusion is still the same – that some employees are unhappy and distrustful with MHP. In the next section, we will explore if this has any effect on the effectiveness of Thyro Slim. 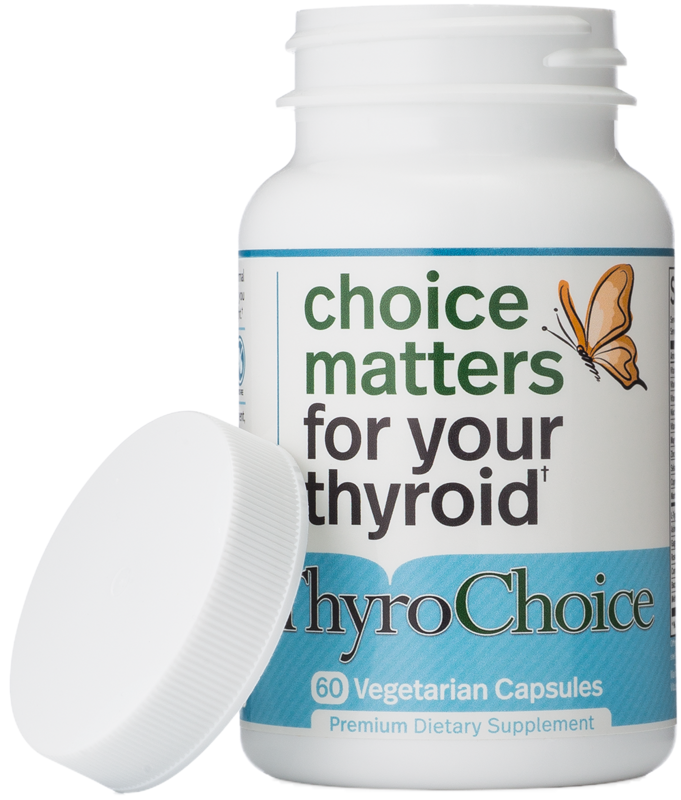 Thyro-Slim and the two supplements, ThyroGenic and ThyroDrene have been shown to be largely ineffective for the thyroid. We have seen that a large percentage of people who take Thyro-Slim do not end up feeling satisfied with their purchase. When such a large amount of money is being spent, you should expect at least a certain degree of success. However, those with hypothyroidism have reported little changes. 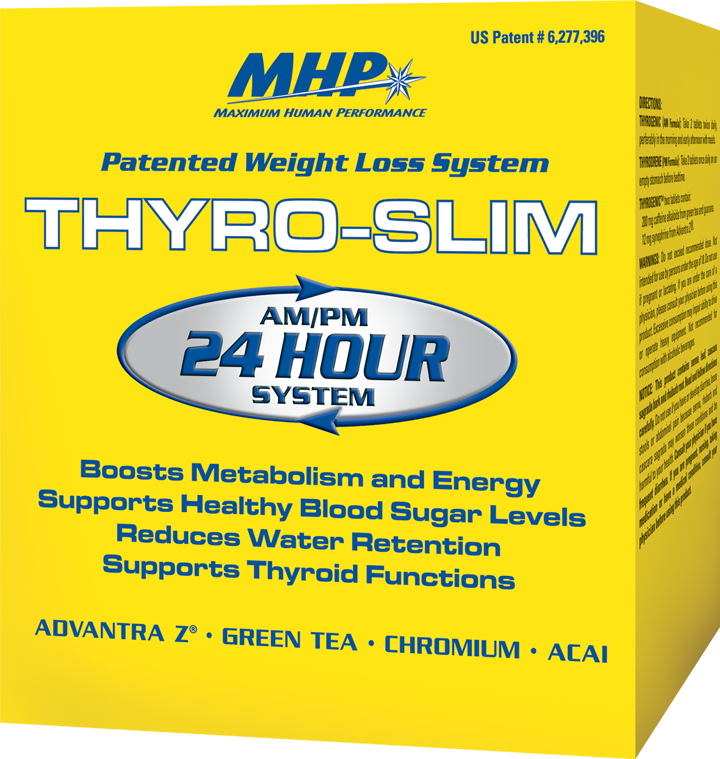 Perhaps this is because most users who take Thyro-Slim, and a result of this supplements marketing efforts, see it more as a weight loss formula than a thyroid support supplement. Interestingly enough, users of this supplement report some weight loss improvements while they take this supplement. However, the majority do not and a lot report gaining the weight back after getting off of it. 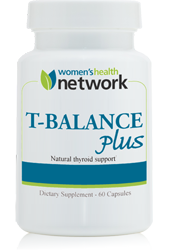 The amount of users of these supplements who report no effects for the thyroid are definitely concerning for the amount of money this supplement costs. We talk more about this cost in the next section below. Thyro-Slim is listed on Amazon as $30.02 with no discount for bulk purchases. 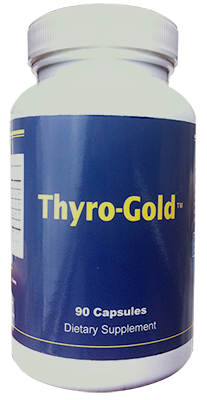 This cost makes Thyro-Slim one of the higher costing thyroid supplements we have seen so far. However, it is also important to note that Thyro-Slim only comes in a 21 day supply. That means that you will be paying around $30 for only 3 weeks worth. If you take this into account and extrapolate the supplement supply to match 30 days, the cost will come to be $42.85. So, that is what you will essentially be paying on average every month to continue taking Thyro-Slim. Is it worth it? That is up for you to decide after reading this review.